This book is a culmination of more than three years of hard work, grit and determination of all the section editors who patiently worked with the individual authors to produce this edition. Basic subjects pertaining to ophthalmology including anatomy, physiology, biochemistry, pathology, pharmacology, microbiology, immunology and genetics have been adequately dealt with in a concise and lucid manner. The section on Vision Rehabilitation and Optics and Refraction has been passionately prepared by committed section editors and authors. 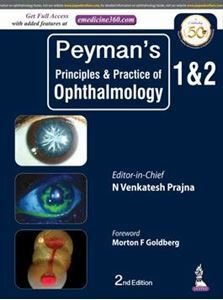 The recent advances and the current concepts in various subspecialties such as Cornea, Glaucoma, Uvea, Retina, Neuro-ophthalmology, Orbit and Oculoplasty, and Pediatric Ophthalmology and Strabismus have been well captured in the respective chapters. I do hope that this book would serve as a one-stop shop for contemporary learning in Ophthalmology. Chapter 14: Why Vision Rehabilitation?